Police praise high school prank. Tamala Edwards reports during Action News Mornings on May 15, 2018. In an unusual move, a police department in Wisconsin is actually praising high school seniors for their creative prank. It looked like the seniors crashed a car into the principal's office, but it was actually an illusion. 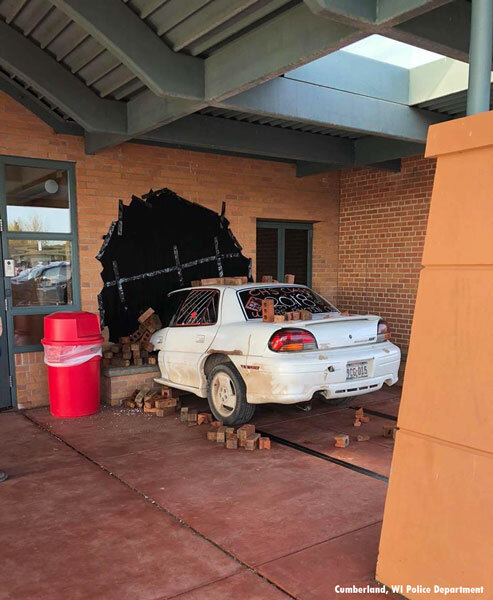 The students at Cumberland High School put the back half of an old car up against the exterior of the building. Pranksters play drinking game in middle of Houston traffic. They also put black on the brick wall to make it look like the car drove into the building creating a big hole. So the school was not damaged at all and police were quite impressed. "Hats off to the Cumberland High School Class of 2018 on your senior prank. Congratulation Class of 2018 on one of best senior pranks that Cumberland High School has seen. Congratulations to all the seniors who are graduating," the Cumberland Police Department said. The Cumberland Police Department called it one of the best pranks the high school has seen.